Há muitos anos que a Eurocircuits fornece notícias e informações importantes sobre nossos serviços, produtos, ferramentas inteligentes para uso gratuito e o mundo da eletronica. Continuaremos fazê-lo e gostaríamos de incluí-lo. Se aceitar, faça o login na sua conta e clique em “ALL”. O seu consentimento é necessário para cumprirmos o novo Regulamento Geral de Proteção de Dados (GDPR), que entrará em vigor a partir de 25 de maio de 2018. Se gostaria de saber como a Eurocircuits gere este tópico, fizemos uma página de informações para explicar em detalhe a nossa política. Se deseja personalizar os assuntos sobre os quais gostaria ou não de receber notícias e informações. Por favor, vá ao seu perfil de cliente da Eurocircuits e altere suas preferências de Notícias e Informações. https://www.eurocircuits.com/wp-content/uploads/070518.jpg 326 720 Dirk Stans http://www.eurocircuits.com/wp-content/uploads/2016/07/eurocircuits.png Dirk Stans2018-05-18 22:50:132018-05-25 13:35:42Não queremos despedir-nos! Durante muchos años, Eurocircuits le ha proporcionado importantes noticias e información sobre nuestros servicios, productos, herramientas inteligentes de uso gratuito y el mundo de la fabricación electrónica. Continuaremos haciéndolo y nos gustaría incluirlo en esto. Si acepta, inicie sesión en su cuenta y haga clic en “ALL”. Si desea personalizar los temas sobre los cuales le gustaría (o no) recibir noticias e información. Vaya a su perfil de cliente de Eurocircuits y cambie sus preferencias de Noticias e información. https://www.eurocircuits.com/wp-content/uploads/070518.jpg 326 720 Dirk Stans http://www.eurocircuits.com/wp-content/uploads/2016/07/eurocircuits.png Dirk Stans2018-05-18 22:46:222018-05-25 13:35:42No queremos despedirnos! Depuis de nombreuses années Eurocircuits vous communique des informations importantes sur ses Services, ses Produits, la libre utilisation de ses puissants outils en ligne et sur le monde de la production électronique. Nous continuerons à le faire et nous souhaitons vous inclure dans cette démarche. Si vous y adhérez veuillez-vous connecter à votre compte et procéder en suivant. Votre consentement est nécessaire afin que nous soyons en conformité avec la nouvelle règlementation sur la protection des données « GDPR » qui entrera en vigueur le 25 mai 2018. Pour en savoir plus Eurocircuits a créé cette page d’informations détaillant sa gestion de mise en conformité. Vous pouvez également personnaliser la communication en sélectionnant les rubriques pour lesquels vous souhaitez recevoir les informations. https://www.eurocircuits.com/wp-content/uploads/070518.jpg 326 720 Dirk Stans http://www.eurocircuits.com/wp-content/uploads/2016/07/eurocircuits.png Dirk Stans2018-05-18 22:38:442018-05-25 13:35:42Nous ne voulons pas vous dire au revoir ! Per parecchi anni Eurocircuits vi ha fornito importanti novita’ ed informazioni sui propri servizi, prodotti, utili tools gratuiti e sul mondo della manifattura elettronica. Il vostro consenso e’ necessario per conformarsi al nuovo Regolamento sulla Protezione dei Dati Personali (GDPR) che entrera’ in vigore dal 25 Maggio 2018. Se volete conoscere come Eurocircuits gestisce questo argomento, abbiamo preparato una pagina informativa per spiegare in dettaglio la nostra politica al riguardo. Se lo desiderate potete personalizzare gli argomenti su cui desiderate (o non desiderate) ricevere aggiornamenti. Per farlo entrate nel vostro profilo cliente Eurocircuits e cambiate le singole preferenze sulle novita & informazioni. 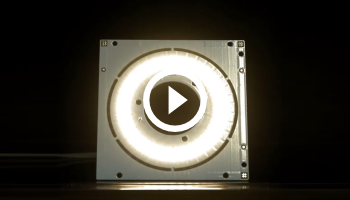 Recently, Eurocircuits introduced a spray coating process for Soldermask, this brings many advantages including a thinner and more unified coating which helps us to meet today’s technology challenges. The Soldermask is imaged using a Dai Nippon Ledia Direct Imaging system; this improves registration accuracy and eliminates the need for Photo-tools. The spray coating of Soldermask is only achievable due to the low viscosity of the ink. Due to this low viscosity however, there may also be Soldermask ink in the barrel of the Via Hole. This may or may not remain after final curing depending upon the data provided by the customer. The Soldermask data we receive for Via’s (holes and pads) varies from customer to customer, the Via’s may have no Soldermask Opening, meaning they are to be completely covered with Soldermask, also known as Tented Via’s. Fully Tented Via Holes cannot be guaranteed with spray coating due to the viscosity of the ink. There may be a small opening in the Soldermask above the Via Hole and there may be Soldermask residue in the barrel after curing. To avoid this we strongly recommend using our Via Filling option when ordering PCB’s with Tented Via’s. MAR(Mask Annular Ring) – the clearance between the Soldermask and the copper pad. 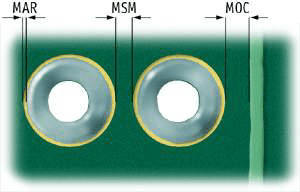 MSM(Mask SegMent) – the bridge of Soldermask between adjacent pads. MOC(Mask Overlap Clearance) – Soldermask coverage between a track or plane and an adjacent Soldermask Opening. 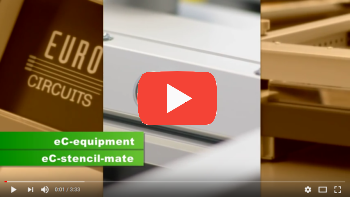 For many years Eurocircuits have provided you with important News & Information about our services, products, free to use smart tools and the Electronic Manufacturing World. We will continue to do so and would like to include you in this. If you agree – Login to your account and click “ALL”. Your consent is necessary for us to comply with the new General Data Protection Regulation (GDPR) which will come in to effective from 25th May 2018. If you would like to know how Eurocircuits manages this topic, we have made an information page to explain in detail our policy. If you would like to customize the subjects on which you would (or would not) like to receive News & Information about. 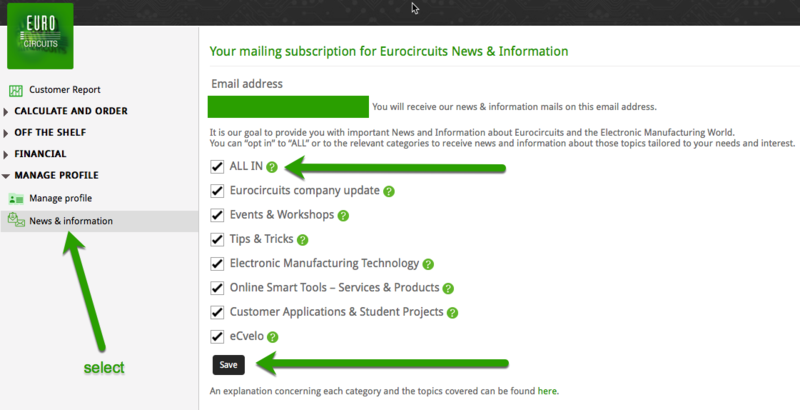 Please go to your Eurocircuits customer profile and change your News & Information preferences. https://www.eurocircuits.com/wp-content/uploads/070518.jpg 326 720 Dirk Stans http://www.eurocircuits.com/wp-content/uploads/2016/07/eurocircuits.png Dirk Stans2018-05-16 18:42:312018-05-25 13:35:43We don’t want to say goodbye! RoHS regulations are designed to limit or eliminate substances that are dangerous to the environment and to people. Inadequately treated e-waste poses environmental and health risks. The RoHS directive is also meant to increase the amount of e-waste that is appropriately treated and to reduce the volume that goes to disposal. RoHS (Restriction of Use of Hazardous Substances) regulations limit specific substances – lead, cadmium, polybrominated biphenyl (PBB), mercury, hexavalent chromium, and polybrominated diphenyl ether (PBDE) flame retardants – in electrical and electronic equipment. Does RoHS affect the quality of PCBs? The European Parliament and the Council of the European Union created a program that standardizes the restriction and use of hazardous substances within the EU while contributing to the protection of human health and the environment. The EU has published Directive 2002/95/EC of the European Parliament and of the Council of 27 January 2003 on the restriction of the use of certain hazardous substances in electrical and electronic equipment and Directive 2011/65/EU of the European Parliament and of the Council of 8 June 2011 on the restriction of the use of certain hazardous substances in electrical and electronic equipment (recast). These directives are commonly referred to as the RoHS and RoHS2 directives. 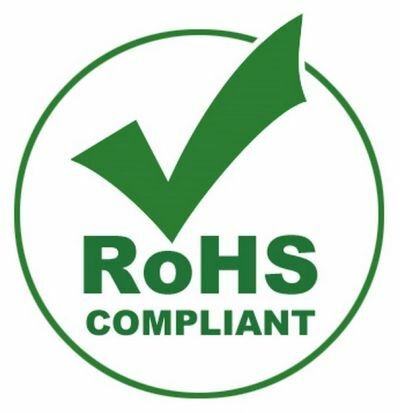 RoHS compliance means acting in full accordance with RoHS regulations. We deem that our products are also compliant with the China RoHS (the Administration on the Control of the Pollution caused by Electronic Information Products). A certificate, signed by two directors that are authorised to represent Eurocircuits, can be found here. It has long been established that the quality of your assembled product has many influencing factors, design layout, material quality, component accuracy etc but many process engineers will argue that the first process is the most critical, the solder paste application. For many years now we have offered our customers Solderpaste stencils, the layout of these being created by your CAD package or we create the paste layer during the data preparation stage and providing accurate paste to PCB application using both our eC-stencil-FIX and eC-stencil-mate. Until now this has been effective, but as we design with more and more fine pitch and odd shaped components the more critical this solder paste application process becomes, requiring further need for control over the solder paste apertures themselves. 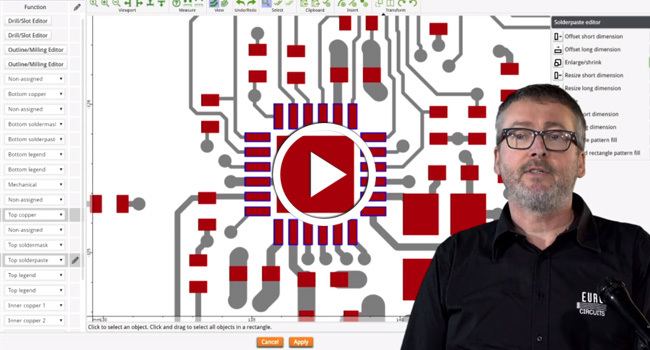 For this reason, our clever developers at Eurocircuits have extended our PCB Visualizer toolbox, enabling you to resize, offset, add or delete and split paste apertures across the design with an easy to use solder paste layer editor. This section contains updates and information about the Eurocircuits Group. As a valued partner you will receive updates and news covering our company activities, team news and business developments etc. The electronic value chain starts with a design and then converting it to a digital form. This section covers all design related issues, their influence on manufacturing. Online Smart Tools – Services & Products. All Eurocircuits customers have access to an online customer account and through this, access to our Smart Tools and services. This section covers User Guides, updates and new features and tools etc. It will help you to optimise your knowledge, use of these tools and the electronic manufacturing services and products we offer. Customer Applications & Student Projects. Eurocircuits actively encourages its customers to share their experiences with other customers. In addition to this, we support many student projects and inspire them to write about their adventures and the technology they have designed. 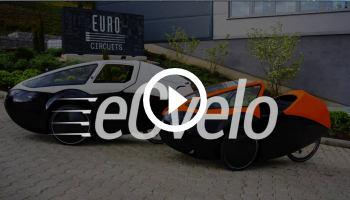 Next to being an Electronics Manufacturing Company, Eurocircuits also has a heart for clean mobility. As result we have developed and are building trike and quad cycles with a covered frame. Keep updated by opting in to this section.